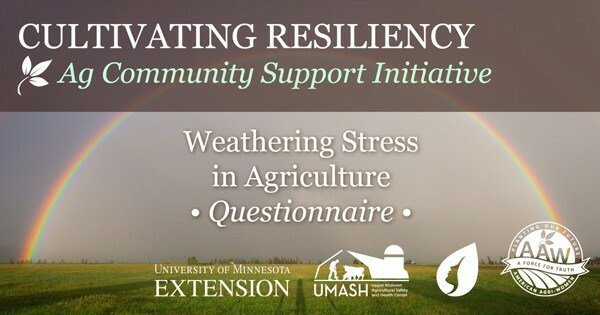 University of Minnesota Extension Women in Ag Network, American Agri-Women and Minnesota Agri-Women’s District 11 are collecting data to learn more about resiliency to stress and women in agriculture. We have developed an anonymous online questionnaire. There is no ability to track information back to participants. This information will be useful in developing resources to help women in agriculture. American Agri-Women will be expanding our national Cultivating Resiliency project based at least partially on what is learned through the questionnaire. We anticipate participating in this survey will take less than 10 minutes. Your participation is voluntary. You may decide not to participate or to withdraw your participation at any time by exiting out of the online questionnaire. Anyone over the age of 18 is welcome to participate. Questionnaire closes April 30, 2019. Please SHARE this link with anyone that may have an interest: farmer, rancher or other agriculturalist. Funding for this project was provided from a grant from the Upper Midwest Agricultural Safety and Health Center (UMASH).